Stay warm this winter with these tips! The winter season brings several rounds of freezing temperatures to Maryland and surrounding states. This can make outdoor working conditions far less favorable for construction workers who are working hard to get their projects done in a timely fashion. You should never underestimate the power of mother nature and the dangers it can cause to people who work outside. To stay warm and safe, workers need to be cognizant of a few things. With that said, keep reading for a few tips on to stay warm at winter construction sites! It isn’t always as easy as throwing on a sweater and a winter jacket. In order to stay safe, you need to be wearing the right layers before you enter the construction site. Your first layer of clothing should be a moisture-wicking material that serves to draw sweat away from your body. You second layer of clothing should be some sort of breathable material that keeps your body warm. A great example of such would be fleece. From there, you want your out layer of clothing to be a jacket that is both waterproof and windproof. As for your hands, try to wear a pair of protective gloves since you probably rely on your hands to get jobs done. 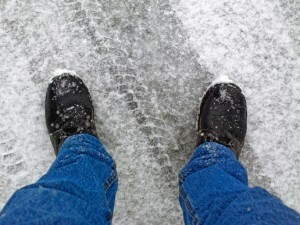 If you want your feet to stay warm and dry, you should wear two layers of socks and a pair of slip-resistant and insulated boots. Many construction workers become too fixated on getting the job done and neglect to rest when it is necessary to do so. You do not want to put yourself in harm’s way by pushing yourself past your own limits. Construction workers need to know the various signs of hypothermia. They include hunger, dizziness, fatigue, shivering, confusion, slurred speech, and increased heart. If you notice any of these signs in yourself or others, be sure to immediately take them to a warm area until they begin to feel better. This entry was posted on Friday, January 25th, 2019	at 7:03 pm	and is filed under Safety Tips	. You can follow any responses to this entry through the RSS 2.0	feed. Both comments and pings are currently closed.